Becoming a Game Master (aka Dungeon Master or “DM” in D&D) and running the game. No one else wants to run the game, so you decide to do it for your friends. In either case, many people believe that running a roleplaying campaign or a one-shot game is planning your adventure. While true, a lot of your game is also planning the logistics of your game just so you can make the game even happen. What type of game do you want to run? 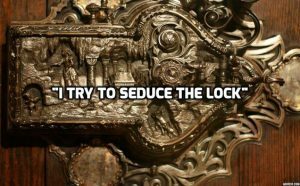 Do you want to run a game with lots of roleplay like handling a heist? Or are you looking to do a dungeon crawl with a lot of fighting and magic missiles? Or a silly hijinx game with friends doing improbable things with a reason to bust out your painted miniature figures? Determine the campaign setting or one-shot game that you want to run and make that clear and upfront with your players. This way everyone knows what to expect in your game because no two tabletop roleplaying games are run the same way. Who are you playing with? Are you playing with people who are familiar with the system? Are you playing with new players? Or a combination of experienced adventurers and first-time joiners? If playing with new players, allow yourself more time to help them create their character sheets and go through the entire experience of character creation. Helping someone with their first character sheet is a privilege and a joy. If you are playing with more experienced players, give any notes on how to determine their stats, and any class and race restrictions… or classes and races you want to encourage! Your table size is going to be important and while you want to bring EVERYONE to the table who asks, you generally want between 3 to 5 players. A good rule of thumb is to limit it to the number of people (including yourself) at an average dining room table. It’s enough space for everyone to be in reach of everything and everyone to see each other around the table. Use an existing mod or writing your own? Both ways are legitimate, but a mod is wonderful because you can review, plug in and play. You can acquire existing adventures at your local game store or even online like the Arcane Library. Writing your own adventure takes time, but I’ve found it’s more important to keep a loose outline with some moveable parts; when you plan a straight road for your players, I guarantee you, they end up going a different path. Don’t be afraid to read out entire descriptions from paper if it sets the setting or the mood! 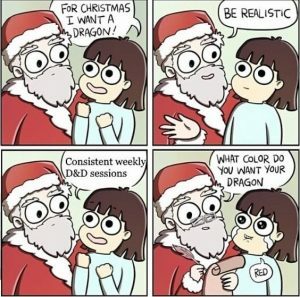 How long is a game session? This is really important to answer rather than say “let’s go to whenever” unless that’s what the whole group wants. Some people want “all-day” games and can easily go 8 to 12 hours. Some have time to do a game for 3 or 4 hours. With livestreaming D&D games like Critical Role, Sirens of the Realms, High Rollers and Girls, Guts, Glory being popular, but also shows like Inkwell Society, Rivals of Waterdeep and the YouTube show, Dacian Brats, growing their fanbases, people assume that a game can be 2 or 3 hours. The huge difference is that on camera, they usually have to keep the action and the story going, but when hanging with friends, people have more time to look up rules, ask questions, strategize on the best possible action in a fight and sometimes allow conversations to go on tangents. A nice rule of thumb is for every player, have a game for that many hours. Will this be ongoing or a limited amount of games? Some people want a game every Tuesday night while others only want to run with a game idea for four sessions. Either way is fine, but be upfront with your players what you intend to run. Based on how things are going, you can always change your mind as a group later. Where are you going to hold the game? Where you hold a game will affect so many things. For example: Are you playing at a dining room table or around a set of couches? Are you going to play at a local gaming store? If you’re playing at a house and you have roommates, check in with your roommates. If you are playing at a gaming store, check on table availability and their hours. Be considerate of the space where you are holding game because it is a significant amount of time. Also, are there pets? Some people might be allergic to cats and dogs. People are also allergic to other substances in the air so if you have any of those, let people know accordingly. Because 3 or 4 hours is a significant amount of time, eating and drinking will be a thing that you are dealing with. Potluck, pizza or GrubHub? Is alcohol ok or are we limiting this to Mountain Dew? Or is everyone responsible for their own food, especially if people have food allergies or are on certain diets? It helps if you determine this in the beginning before people get there so you have someone starving because they did not know what the plan was. Frankly, I will feed someone rather than have them starve at my gaming table. Also, determine where you’re going to put food and drinks in relation to the gaming stuff. Having a bag of chips on the table might be easy access for your Mage munchers but the last thing you need is fruit punch all over your character sheets. The biggest one: When to meet? This is infamous everywhere that everyone wants to game but no one can agree on a time. There are entire memes dedicated to this. I’ve solved this problem by using Doodle, where you put down your available dates and times and all your players respond by checking off their availability and the one with the most green check marks becomes when you meet. Of course, in the past, I as the DM have also said, “I am running game at this date and time every week: I will not stop a game because you’re not available.” If you are the one planning the game, this is a legitimate way to do this; you’re planning the game, they should be coming to you, you should not be running after everyone. *Rulebooks. A Player’s Guide if you have it and a Dungeon Master’s Guide. Any supplemental books or pages would be good to have as well. *Laptop or tablet if you are using online resources like PDFs. Also, quick access to rules and flavor on the internet is handy. *Character sheets. There are some virtual character sheets available in places like D&D Beyond and other apps. *Pencils and Paper. You can have pens, but pencils are just more… erasable when information changes. *Dice (or whatever roleplaying mechanism is used). 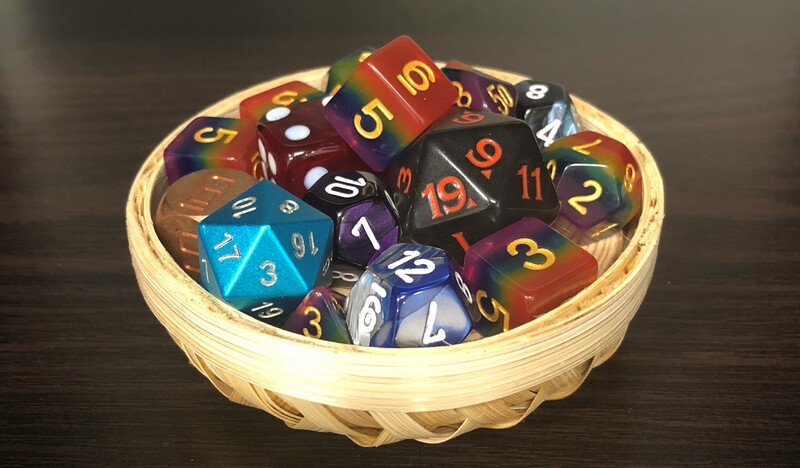 Multiple sets of dice are handy, especially in the case a player forgets theirs or if you believe some dice tend to roll better in certain situations than others. 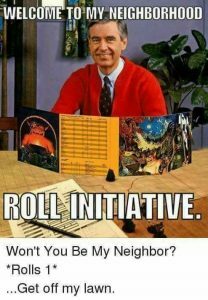 *DM screen. A place to hide your rolls, cards, notes and other minis. Some Dungeon Master screens have condensed versions of rules to help arbitrate dice rolls, which is super handy. *Dice trays so you have places to roll your dice so they don’t roll onto the floor or knock things over. *Miniature figures to represent the player and enemies in battles, D&D Miniatures are available, but you can get custom minis from places like HeroForge. 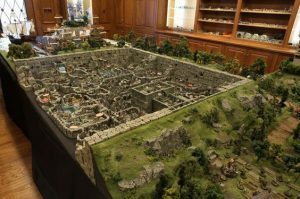 *Maps and Terrain to display the environment your characters are in (and to help with strategic combat), like the maps of Mats by Mars or the terrain of DwarvenForge. *Stat trackers and Order Trackers to help the DM figure out information for your NPCs and enemies and combat initiatives for your characters like the ones from Top Dog Games. *Environmental soundscapes to enhance the mood such as Syrinscape. *Spell, item, monster, and class ability cards so you can see your abilities at a glance without needing to refer to a book, like the ones made by Gale Force Nine. Hopefully, with all this prep on how to be a dungeon master (logistically), this allows you to handle everything that you need to for game so that you can tell your guide your players through your own adventure, without making an entire adventure of running the game in the first place. Check out our other articles here at Critical Shots!